The 80's is considered a terrible decade to some; in terms of music it's often referred to as a terrible mess after what came in the 70's. But for an 80's child such as myself, it'll always have that wonder to it – that glow that you just can't put a bad name on because there was just too much cool stuff happening. Let's see, for the fun of it, just look at all this awesome: Flight of the Navigator, Harry & the Henderson's, E.T., Indiana Jones, Tron, Ghostbusters, Back to the Future, The Goonies, Jaws; and on the music side of things; Depeche Mode, Duran Duran, Cyndi Lauper, and even if you hated synthesizers, there was Alice in Chains, Metallica, The Ramones, Nirvana, Soundgarden, Pearl Jam. Making their debut in comics were: Teenage Mutant Ninja Turtles, Watchmen, The Dark Knight Returns ... Seriously, this decade was incredible! You grow to miss it, like many miss the years of their youth. Every once in a while you'll see an attempt at sampling that great past of yours and it brings back those feelings of nostalgia. 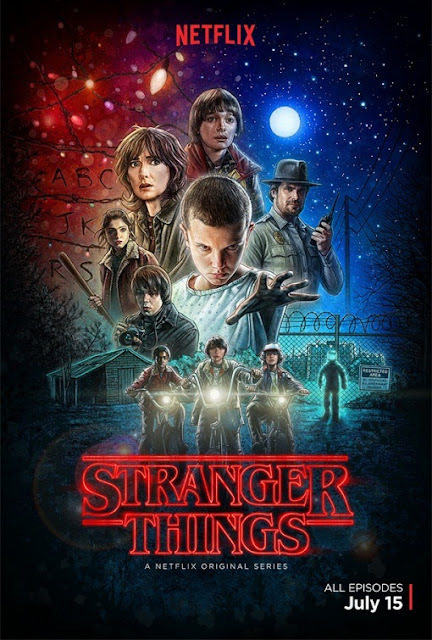 But then once in a while, if you're lucky, you not only get a remake of something great (personally I thought Tron: Legacy was a great continuation of the first film, especially when viewed back-to-back), but you get something completely brand new that's also an incredible nod to the 1980's, and Stranger Things does that. Really well, actually, and it's a great thing to watch it happen. Stranger Things is all of the aforementioned – a walk through the nostalgia without being condemned to a remake of something actually from the 80's. Which is great because that means new characters and a story that you get to love. Taking place in the small town of Hawkins, Indiana, the story at first revolves around a missing boy, Will. His family contacts the sheriff once they realize he's gone missing. His close group of friends, Mike, Lucas, and Dustin, pursue their own investigation, as does the sheriff. His mother, engulfed in grief, begins showing signs of what her son and the sheriff think are incidents brought on by stress. She feels as though her son is using the lights to contact her from wherever it is that he's trapped. And once they realize she's right, other pieces to what they didn't know was even a puzzle to begin with, start connecting. Nearby, there is a Hawkins lab that begins it's search for a little girl that unbeknownst to the locals, has somehow escaped them and they are ruthless in their effort to find her. Going to murder tactics to obtain her once more. Eleven is that little girl, and she's a force of nature. How much of that is man–made and how much she was born with is unknown at this point. But it soon becomes apparent what she can do and the extent of her abilities is revealed in astounding incremental scenes as the season goes on. In their hunt for Will, she helps his friends, deviates them, and generally attempts to protect them from what she calls the "badmen." And no, that's not limited to just the government trench–coat–wearing (in all it's classic glory) bad guys. There is another force of nature that has abilities not yet fully explained, making it's appearance at times that may haunt you when you're walking down the hall or looking at the walls or ceiling at night. All around great casting done here, but the story is about the characters after all, so the writing deserves the leaning majority of the praise. Don't you just love the nostalgia of the drawn promo poster?! The music is nothing short of magnificent. The score to the series is a fantastic mix of synthesizer beats in the tradition of Tron. The Clash song "Should I Stay or Should I Go" is a thematic recurring element of Will's. There are several other songs throughout the show that you'll surely recognize if you're a child of the 80's. If you have children of your own that are able to take the fright as it pops up, it's an opportunity to point out the tunes you recognize so maybe they can get in on stuff from your childhood. The atmospheric change when the scenes trade places from that of a normal setting to an eerie oncoming presence are well done and fold seamlessly within the show. The band responsible for this is Survive – who will be releasing their second album soon. It was also announced recently that there will be a collection of the music from the 80's that they're using re-released under the Stranger Things title. The way the central child characters interact with their science teacher is another great aspect of the show. Along the way he explains to them the theories of what they think is happening, but they don't reveal their reasons to him. He in turn takes it as curiosity and offers scientific explanations of what they call "The Upside Down" – an aspect taken from their love of Dungeons & Dragons' Vale of Shadows – that they think is somehow connected to what Eleven indicates as a type of blackness; a world predominantly covered in darkness that contains secrets that she's somehow unwittingly stumbled into during her government tasks. "The Upside Down" is one of my favorite features of the show. I can't tell everything without tossing spoilers out there and ruining it for you, but the best part about this is that even though you have a fairly linear story, the Upside Down is always there! It masks certain things and is a force to be reckoned with because it contains so many secrets. Some of which are revealed by the first season's end, but there is the implication that they've only touched the tip of an incredibly massive iceberg. Can't wait for season 2 and what will surely be further exploration of this element of Stranger Things. Throwback stories like this really should happen more often, especially in the spirit of how well done this series is. It'd be a great trip to see more decades throughout history relived through the eyes of childhood. This is a great series that deserves the hype it's getting at the moment and I highly recommend you check it out for yourself. Of course strange things like this really don't happen as often as they should, but one can always hope that the staples of the popular culture that were rampant in their youth will make a nostalgic comeback such as this one.